When ever I see mango ginger(mamidi allam/maa inji) in the market I cannot resist myself without buying it.Both of us love the simple marinated version of pickle with it which goes very well with curd rice.This time I bought them in a larger quantity to make this chutney/thokku which can be preserved for longer and comes handy to serve with breakfast items like Idli/Dosa when we want.When needed we just need to mix water with the required amount of thokku to get the chutney consistency,it is ready to serve. Soak tamarind in little hot water until it softens.Let it cool completely. Wash and scrape the skin of mango ginger and cut them into pieces roughly. 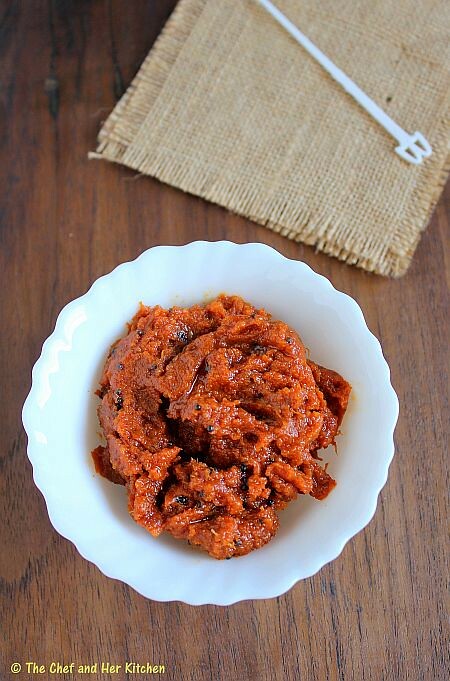 Grind mango ginger with tamarind,grated jaggery,red chili powder and salt to a fine paste.Do not add water while grinding,use little water in which the tamarind is soaked. Check the taste now and adjust salt and chili powder if required.if you want it more tangy or more sweeter adjust the chutney as per your taste buds at this point. Heat oil in a thick bottomed kadai and crackle mustard seeds and add asafoetida to it and add the ground mixture and fry it over low-medium flame until it leaves the oil in the edges.It takes 15-20 minutes approximately.The water content in the chutney/pickle should evaporate completely and the oil should float in the edges and top.This way the shelf life of the pickle would be longer. Cool the pickle completely and store it in a glass bottle or air tight container.It stays up to an year if prepared carefully. When required scoop out some portion and add a couple of tbsp of water to it and mix well. Serve it with Idli/Dosa/Bajji/Punugulu/Bonda/Pesarattu/Gunta Ponganalu/Adai.You can even serve it with rice. 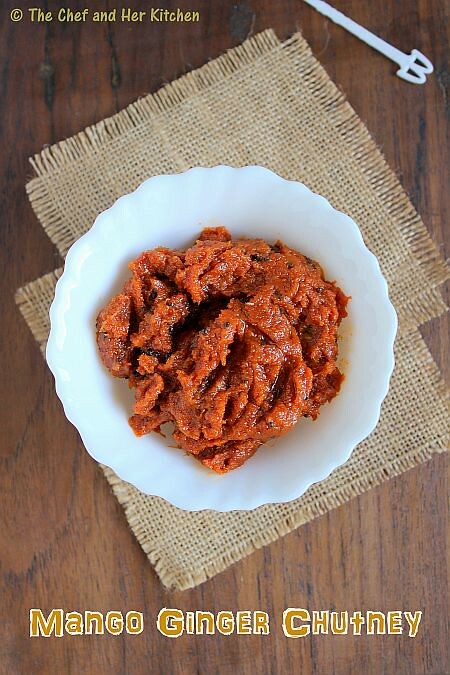 You can use regular ginger instead of mango ginger and follow the same recipe to make regular ginger pickle.It comes handy to serve with Idli,dosa and other breakfast varieties. This pickle really tickles your taste buds as it is loaded with burst of flavors. Feel free to adjust the tangyness,sweetness,salt and spicyness according to your requirements after grinding the chutney. I bet that’s hot and my mouth is watering while I’m typing. Love this tangy and yummy chutney. apt for curd rice ! i absolutely love maainji and anything made with it! This is something new to know. wow....amazing and so tempting they look. Your mango ginger chutney looks stunning! Mouth watering! Mango ginger chutney looks delicious.